Back home, when someone went astray, or got disoriented, the old folks would say they were fairy led. As in led astray by the fairies. Well there were no fairies involved in this story, but we were definitely astray! Bakeapples, or as they are known in some parts, cloud berries, are a favorite back home. They are very sweet, with a sticky consistency, that’s great for jams and to top other things with. Mom has been known to make a bakeapple tart in the same manner as people make partridge berry tarts. I was never a big fan of them myself, I do like them, but find them overwhelmingly sweet, and don’t want a lot of them. But for some reason, one summer, around the same time as now, prior to me moving away to Nova Scotia, Bernard and I decided to go bakeapple picking. On the upper end of Random Island, there is a big big barren where bakeapples grow. 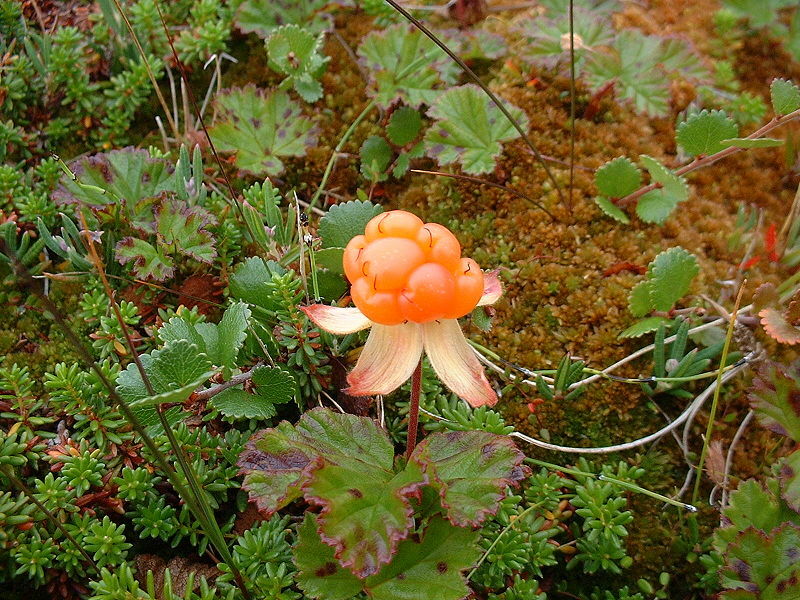 One thing about bakeapples though is that they grow one berry per plant, nearly on the ground, and the plants are often 6 inches to several feet apart. We went through the woods at the tv tower, and walked through the short bit of woods till we got in on the barren. We then walked till we found some berries and got down to picking. The big issue though is that once you’re in the middle of a barren, with your head down, when you look up all the directions look pretty much the same. We picked and picked till we were both tired and later evening was coming on, and then decided to make our way out of the woods. Well of course when we looked up, nothing looked much different than anything else. Luckily the barren was up on a rise, and we could see water, but unluckily, Random Island is an island, and water was visible in many directions. Also unfortunately trees blocked some of the view, so we could only see water in the distance, and not see the bar bridge. Well there was nothing for it, but to pick a direction and start walking and so we did, for what seemed like hours till we got to the edge of the barren and found a path. We decided to follow it, with no better plan, and it shortly intersected with a much larger path, which turned out to be the road that someone whose name now escapes me had at the upper edge of the island for their mill. We finally made it back to the road, and started our hike back to the car which was about 2 or 3 miles back at the old tv tower. Not much traffic on the island, so we were resigned to walking the whole way, when finally a car came by, and who did it turn out to be? Dad and Mom! So of course the picked us up and carried us back to the car, from where we finally made our way home after being …… bakeapple led.